Editor’s note: This Care2 favorite was originally posted on July 25, 2013. Ever wondered if your kitty really loves you? From finicky to feisty, our feline friends aren’t always the easiest to read. Unlike dogs, who make their affection for us loud and clear, cats have far less obvious ways of communicating how they feel. If a person were to do it to you, then you’d have a pretty good idea of what they were trying to tell you — but with a cat it’s a whole different story. To be on the receiving end of what is actually known in the cat world as ‘head bunting‘ is a very special privilege indeed. During this exchange, your cat deposits facial pheromones that represent their feelings of trust and safety they have with you. Cats purr for all sorts of reasons, but there is one unique full-bodied rumble that your kitty saves exclusively for their true love. Purring also lowers your kitty’s heart rate and helps them to relax and exhibit feelings of contentment. You can tell a lot by looking at a cat’s tail. Just as their tails puff out when they get scared or agitated, their tail will twitch at the very tip when they are feeling bliss. If you notice this action when your cat approaches you, then you can be sure that they think you rock their world. When your cat throws itself on the floor and starts rolling around, they are trying to get your attention. Cats only show their tummies voluntarily to those they can trust. Feeling safe means a lot to a cat, so when they sprawl out in front of you, this is a sign that they feel loved and protected. It’s not often that humans are deemed worthy of these very special grooming sessions, but if your cat has chosen to bestow you with hair or ear licking, rest assured you have been welcomed into the inner circle. Grooming is one of the most obvious signs of the friendship and trust you have with your furry companion. Kittens knead against their mothers to stimulate milk production, which is why experts believe that kneading behavior in cats is nostalgic of kittenhood and acts as a way of reliving the happy moments they experienced as little ones. So next time your kitty starts moving its paws up and down on you, remember that they are not just trying to soften you up before taking a nap, but that they’re expressing their adoration for you. It is said that cats kiss with their eyes, so don’t expect to share this sign of affection with any old cat. Cats save eye contact for people they know and trust. If that eye contact is coupled with slow blinking, then you’ve just received a kitty kiss. Return the love by mimicking the behavior. Kitties crave warm safe places to sleep, so if your fluffy feline decides to snuggle down beside you — or better yet, on your lap — then you should feel especially honored. Cats are most vulnerable when they are sleeping, and there is no greater compliment than when they choose you as their snooze spot. There is no denying that a small dead something is not at the top of our wish list, but a kitty that presents you with this bounty deserves to be praised. Despite our domestication, cats still have the inner hunter — and sharing their prizes with you is a sign of true friendship. If you’ve been fortunate enough to share your life with a cat, then you’ll understand that they are consciously connecting with us. 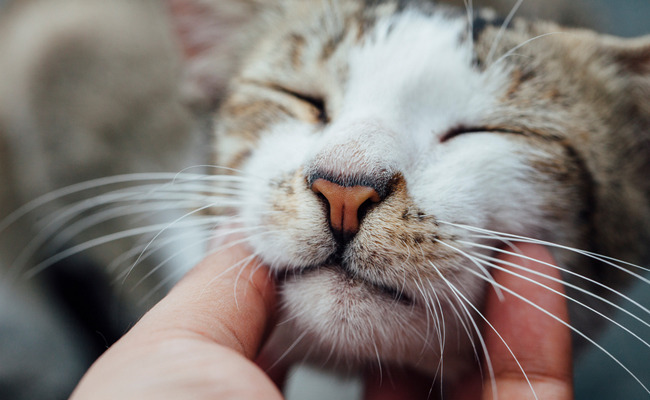 Whether it’s via grooming, purring or snuggling up, cats are loving and affectionate individuals that form very special bonds with their favorite people. I love cats, and found the more I learnt, the more there was to know! Cats are incredible and unique. Sadly, I was unable to fix behavior problems and think my cat is "just born that way". It wasn't until I stumbled upon this goldmine guide on how to communicate with your cat I found HERE ( http://talk-to-yourcat1.hqtips.info ). I now understand exactly how my cat is feeling and what he has always been trying to tell me. I love cats, and found the more I learnt, the more there was to know! Cats are incredible and unique. Sadly, I was unable to fix behavior problems and think my cat is "just born that way". It wasn't until I stumbled upon this goldmine guide on how to communicate with your cat I found HERE ( talk-to-yourcat.hqtips.info ). I now understand exactly how my cat is feeling and what he has always been trying to tell me.